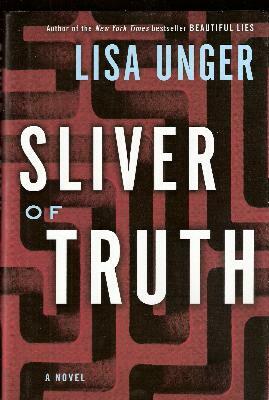 Sliver of Truth is the follow-up to Lisa Unger’s hit Beautiful Lies. I remember really enjoying Beautiful Lies, and I wasn’t disappointed in its companion. I did have the problem that I could not remember much from the first, since I read it so long ago. But, I was able to recall enough to really like this book. Ridley Jones returns, and is informed by the FBI that her Uncle Max, who is really her biological father, is alive and had staged his death in the previous story. Ridley again learns how little she knows about her own life and the players in it, and finds herself in pursuit of truth and being pursued by some nefarious characters. I was again impressed by Unger’s writing and dialog. Ridley is intelligent and strong, but you still hope for someone to help her along the way. Often, I feel mysteries and suspense novels have trouble with pacing, with lulls and then bursts of activity. However, Sliver of Truth is masterfully paced throughout, always suspenseful, with just enough pauses to let you catch your breath. This entry was posted in Book Reviews, General Fiction and tagged Beautiful Lies, Lisa Unger, Sliver of Truth. Bookmark the permalink.